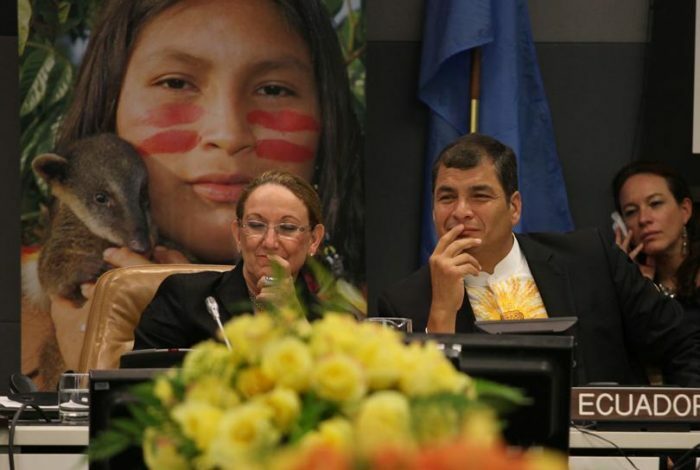 Ecuador: the great environmental defender? In August 2010 Ecuador became the first country in the world to agree to leave part of its vast petroleum reserves in the ground, unexploited for perpetuity. The protected oil is in what geologists call the ITT deposits, located under Yasuni National Park. The Park is a protected rainforest that may be the single most biodiverse area in the world, according to a 2010 study published in the scientific journal PLOS One. Yasuni has more species of frogs and toads than all of the US and Canada combined: a single hectare in Yasuni was found to have 655 tree species. The Park is home to the Waorani and Kichwa indigenous peoples. The ITT area is said to also house two uncontacted tribes, the Taromenane and Tagaeri. The “uncontacted” live in voluntary isolation, not wanting any contact at all with the white man. It wasn’t just for the love of frogs or concern for the uncontacted that Correa’s administration chose to say no to drilling. In exchange for Ecuador leaving the area untouched by oil exploration, international donors pledged to give the government $3.6 billion, approximately half of the money it would have earned if the oil had been exploited. The oil in Yasuni National Park is worth $7.2 billion at 2010 prices, minus operating costs. Known as the Yasuni ITT Initiative, the agreement was celebrated by environmentalists all over the world as evidence that environmental protection could go hand in hand with economic development. But it did not work. The international community failed to come up with the money, and in 2013 the government pulled out of the deal and authorized drilling to start. Local and international activists, however, refused to call it quits. A group of local activists formed the Yasunidos Coalition as a way to continue the fight. Perhaps unsurprisingly, the campaigners accuse the Ecuadorian government of putting up all sorts of obstacles in the campaigners’ way. 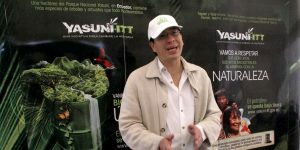 WhoWhatWhy spoke with campaigners and government officials who poured their hearts into the Yasuni ITT Initiative. All agree it was a great idea and worth their effort, but after the Initiative’s failure the former allies ended up in opposing camps, disagreeing on what should be done now. The headquarters of Acción Ecológica (AE), the country’s leading environmental group, are located in a suburban house in the capital city of Quito. It is also the home of Yasunidos, which is one of the many campaigns that the group supports. Acción Ecológica, formed in the 1980s, has participated in every stage of the Yasuni Initiative—from its inception through the Ecuadorian government’s 2013 decision to abandon it. “We want a national referendum on the question of oil drilling in the Yasuni. That’s a right that we citizens have under article 104 of our country’s constitution,” said Chavez. A little political history is in order here, because Ecuador’s constitution figures prominently in this tale. In the mid-2000s, the country’s progressive forces banded together and formed the Alianza PAIS party. It advocated a mixture of socialism and bourgeois reformist liberalism. As such, it was dubbed the Citizens’ Revolution (Revolución Ciudadana). Revolución Ciudadana was led by its presidential candidate, the charismatic and energetic leftist economics professor Rafael Correa. At the heart of this movement was the creation of a new constitution for the country. The party won the 2007 election and President Correa made good on his promise, calling for a constituent assembly which drafted a new magna carta for the country. Esperanza Martínez, head of Acción Ecológica, was one of the assembly’s high-level advisers. Acción Ecológica has played an important though largely unacknowledged role in recent Ecuadorian history. It is not the usual single-issue green advocacy group. Its work covers a very wide array of issues: health, human rights, food sovereignty, mining, water, free trade, energy, solid waste, and much more. It is the institutional home not only of Yasunidos but also of the Network for a GMO-Free Latin America (RALLT), the Tegantai environmental press agency, a multidisciplinary environmental clinic, and the Institute for Third World Ecologist Studies (ITEM). Alberto Acosta, who chaired the constituent assembly, is himself a high-profile environmentalist with a long association with AE and ITEM. The pro-government Correísta militants view AE’s mostly female staff as meddlesome, and sometimes refer to them as “las eco-chicas”. It’s not exactly a compliment, as it translates to English roughly as “the eco-babes,” which can have sexist connotations. The constitution written by the constituent assembly, which the Ecuadorian electorate approved overwhelmingly, is one of the most progressive in the world, in both social and environmental terms. It recognizes that nature has rights of its own, and provides innovative mechanisms for citizen participation, including the right to introduce ballot measures. In addition, Correa made support for the Yasuni ITT Initiative official government policy. The funds received from the international community were to be placed in a trust fund administered by the United Nations Development Program (UNDP), and be used for social welfare and sustainable development programs. In 2010 the government signed on to a legally binding agreement with the UNDP to set up the Yasuni ITT Trust Fund. It wasn’t as if the money came without stipulation. If Ecuador was found to be using the funds for purposes not indicated in the agreement, or if a future government decided to drill in the Yasuni area that the deal covered, it would have to return the entire $3.6 billion to the donors. While $3.6 billion may seem like a huge fund allocated for a single environmental undertaking, it’s a drop in the bucket when compared to, for example, global military expenditures. According to the Stockholm International Peace Research Institute, global military expenditures for 2014 totalled $1.747 trillion. Military expenditures were $581 billion in the US alone. Consider also that the proposed US government budget for this year is $3.9 trillion. So the Yasuni ITT Initiative cost less than one percent of annual US military spending, and less than one thousandth of annual US government spending. Acción Ecológica raised its voice in protest, and Correa responded in 2009 by closing the organization down. This drastic action was executed in a rather undramatic way: the Health Ministry served the group with a notice stating that their non-profit charter had been revoked. Correa rescinded his action only after an international months-long campaign of support for the organization. But the damage was done; Acción Ecológica and the Citizens’ Revolution parted ways and would not be allies again. Correa’s brash words and broadsides against environmentalists in no way have undermined his enormous popularity. In March 2013 he was re-elected with 57% of the vote. Between 2009 and 2013 the Yasuni ITT Initiative seemed to be the only thing that the government and environmentalists could work together on. But then in August 2013 the money from international donors ran dry. What happened? I asked Acción Ecológica president Ivonne Yanez. Also, the fundraising effort was assigned to Ivonne Baki, an unqualified and controversial personality, according to Yanez. “Her approach was elite, celebrity-based, and she did not have a grasp of the issues of environmental justice”. Baki has often been described by critics as an unprincipled political wheeler-dealer. In 2011 the Amazon Defense Coalition accused her of trying to help Chevron bribe the Ecuadorian government with $1 billion. Correa blamed the international community for the outcome, saying that “The world has failed us.” He argued that Ecuador, as a poor country, is badly in need of economic development, and urgently in need of foreign currency to fund its progressive social programs that help poor people. The activists, in turn, accused the president of never having really supported the initiative, and even of deliberately sabotaging it. In the last couple of years Correa has raised the tone of his verbal attacks against the activists, accusing them not only of being “infantile environmentalists” but also now of being servants of a sinister imperialist agenda. Alianza PAIS militants frequently associate the letters NGO (non-governmental organization) with CIA. Acción Ecológica spokesperson Chavez told of Yasunidos volunteers scouring the whole country between 2013 and 2014 collecting 600,000 signatures petitioning the government for a national referendum on the fate of the Yasuni. That equates to roughly 4% of Ecuador’s population. He is very confident such a referendum can be won. But is that assessment realistic? According to an opinion poll by the pro-government daily newspaper published on April 2014, 72.3% of the population favors a referendum on the matter. But on the other hand, a 2013 a Cedatos Gallup poll found that 56% of Ecuadorians polled favor oil drilling in the Yasuni, with 32% against. In a third world country whose economy depends greatly on oil revenues, the ability of this activist movement to convince even a significant part of the citizenry, let alone a majority, to leave oil deposits untouched in order to save a rainforest is no small feat. It was a not-too-subtle accusation of fraud on the part of the Commission. But experts from two top academic institutions, the Escuela Politécnica Nacional and the Universidad Andina Simón Bolívar, examined the signatures and concluded that over 99% of them were valid. That’s also an indirect accusation of fraud. Both sides can’t be right—someone here is playing foul. These irregularities have cast a shadow on the Citizens’ Revolution among some sectors of the population. In response, some opposition and environmentalist groups have popularized the hashtag #DemocraciaEnExtinción (Democracy in Extinction). Yasunidos is also requesting access to the land in the ITT where drilling has already started. “We believe Petroamazonas, the company that’s starting its drilling in the ITT, is in violation of its approved environmental impact statement (EIS),” said Chavez. The activity he referred to is a newly-built, 20 kilometer-long access road , which Yasunidos alleges is far wider than the EIS allowed. But the Environment Ministry, which controls access to the Park, has denied Yasunidos entrance to the area in dispute, arguing that the activists have no legitimate business there. Not surprisingly, the Ecuadorian government does not share Yasunidos’ views. According to Granizo, the Initiative was never primarily about biodiversity. It was first and foremost about climate change. It is estimated that the Initiative would have prevented 407 million tons of carbon dioxide (CO2) from being released to the atmosphere. This is no small matter, considering that global atmospheric CO2 levels have surpassed the 400 parts per million (ppm) mark, way past the 350 ppm which climate scientists say is the highest it can be if the atmosphere is going to remain stable. At a time when Puerto Rico and California face unprecedented droughts, Texas gets submerged under 8 inches of rain, and thousands in India are literally dropping dead from the heat, atmospheric CO2 levels are no academic matter. The Yasuni ITT Initiative, once celebrated as proof that ecological awareness and economic development could co-exist as public policy, has devolved into yet another debate between polarised adversaries. As of now, neither side is willing to back down.